Tulpe cultivée (Varieté) - REDOUTÉ, P-J. 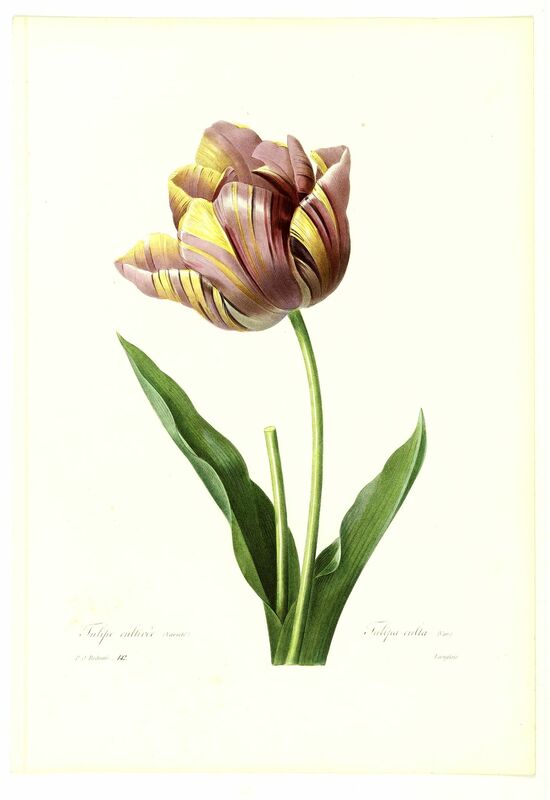 Title : Tulpe cultivée (Varieté). Map maker : REDOUTÉ, P-J.. Size : 14.0 x 9.8 inches. / 35.5 x 25.0 cm. Description :Engraved by Langlois, with plate number 142. A beautiful image from "Choix des Plus Belles Fleurs": one of greatest flower books ever published by the most celebrated flower painter of all time. Pierre-Joseph Redouté's (1759-1840) mastery of coloured stipple-engraving was a significant contribution to the artistic and accurate rendering of flowers. He learned the technique from Francesco Bartolozzi while visiting England with L''Héritier de Bruutelle, and reputedly introduced it to France. Hunt Redouteana 21. Dunthorne p 235. Great Flower Books (1990), p 129. Nissen BBI 1591. Pritzel 7456. Stafleu & Cowan TL2 8750. Condition : Stipple engraved plate, printed in colour and finished by hand. In very good condition apart from some very minor spotting, mainly in the lower margin. Paper size 395x25cm.